Last night, I questioned everything I thought I believed. I found myself face-to-face with my greatest fantasy and my greatest fear. I stared deeply into the abyss. To be fair, this delicious disaster does not yet exist. It is merely theoretical . . . as the hydrogen bomb once was theoretical. 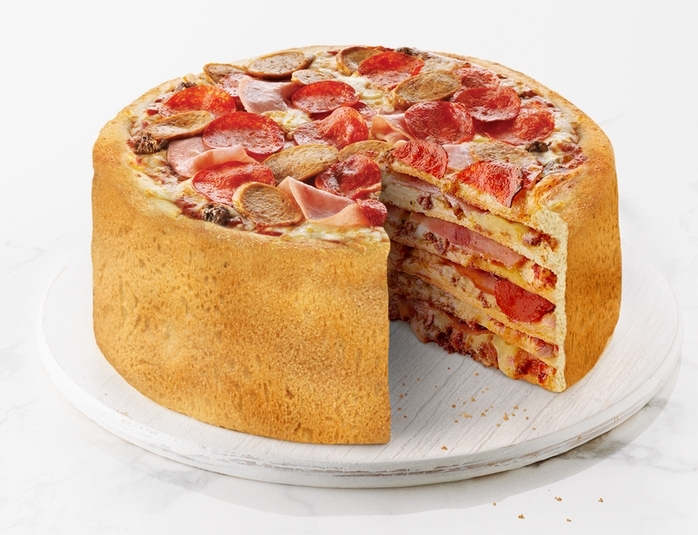 Pizza chain Boston Pizza (which, despite the name, operates mostly in Canada) will begin making this “pizza cake” if the cutting-edge item gains enough support in an online poll. So far, the pizza cake is the runaway winner. It was nice knowing (a few of) you. To hazard a quick guess at the caloric content by approximating some of the nutritional information on the Boston Pizza website, assume that each of the six layers is equivalent to a medium pizza. Further assume that each medium pizza has eight slices, and that each slice has around 250 calories to account for the added caloric content of the cake(!) batter. That means that just one of these dietary chimeras clocks in at about 12,000 calories. That’s equivalent to a healthy person’s total caloric intake over the course of about five or six days. And, so, I have analyzed this grim vision of my—nay, our—future, leaving me with only one thing to say to anyone (unfortunate enough to be) reading this. This entry was posted in General Culture and News, Pictures and tagged Boston Pizza, Diet, Food, General Culture and News, Pictures, Pizza, Pizza Cake. Bookmark the permalink. Wow. I totally forgot about the Double-Down.